HaySparkle: Raspberry & White Chocolate Valentines Cupcakes! 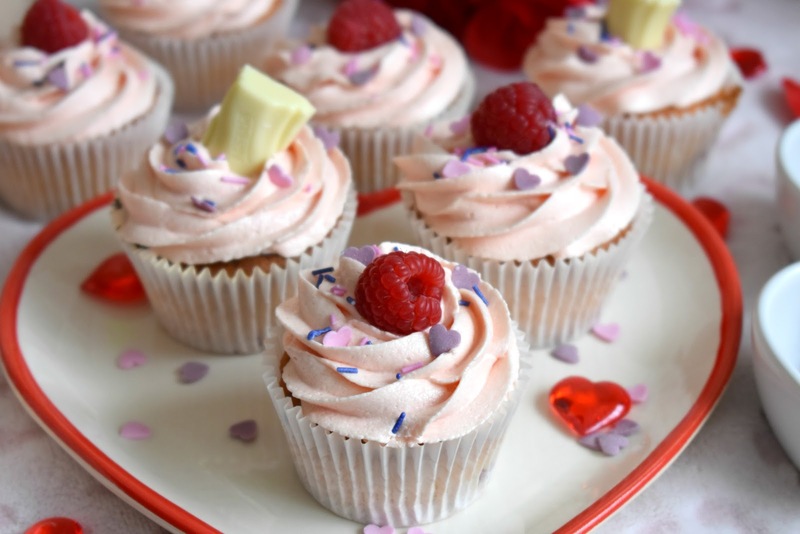 Raspberry & White Chocolate Valentines Cupcakes! Valentines Day is fast approaching - so obviously that gave me the perfect excuse to get back into the kitchen and do what I love....and that's to get my bake on! 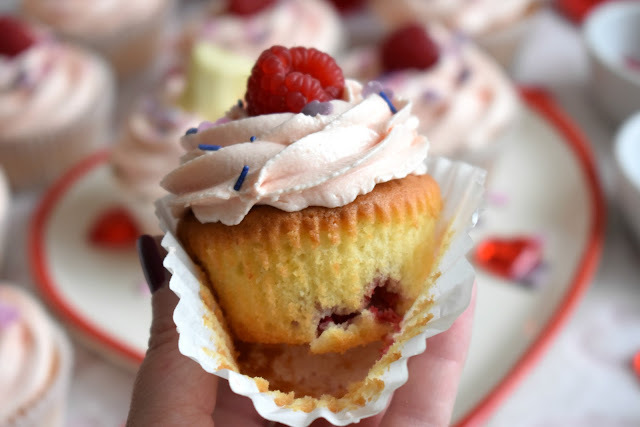 Today I have a yummy raspberry and white chocolate cupcake recipe for you which is not only quick and easy to make but they contains one of your five a day too (lol)! These are the perfect Valentines treat for you and your partner to share or you can make them for you and your best girls to enjoy if you like! 1. Firstly pre-heat your oven to gas mark 4 /180 and line a muffin tin with your cupcake cases. 2. In a large mixing bowl, whack in your butter and caster sugar and mix until smooth with a hand whizzer. Once the butter and sugar mixture is smooth whack in all the remaining ingredients apart from the raspberries and beat again! Finally fold in the raspberries carefully as you don't want them to break apart, you want to keep them as whole as possible within the batter. 3. Pop a heaped tablespoon of the cupcake batter into each cupcake case and bake in the oven for around 18 minutes or until the top of the cupcakes are springy to the touch, then transfer onto a wire rack to cool. 1. In a large bowl, beat the butter with an electric whizzer for around 5 minutes or until smooth and whippy, then start adding the icing sugar slowly to avoid the dreaded icing sugar cloud and again mix until smooth. Then pop in the vanilla extract and a couple of tablespoons of milk if you feel your buttercream is a bit stiff. Once the icing is at the perfect consistency pop in the food colouring a tiny bit at a time until you get to your desired shade of pink. 2. Pipe or spoon the icing on top of the cupcakes and top with some sprinkles if you like, I found these cute little princess sprinkles in Tesco which I thought looked perfect for Valentines Day, I also popped some remaining chunks of white chocolate and raspberries on mine too! 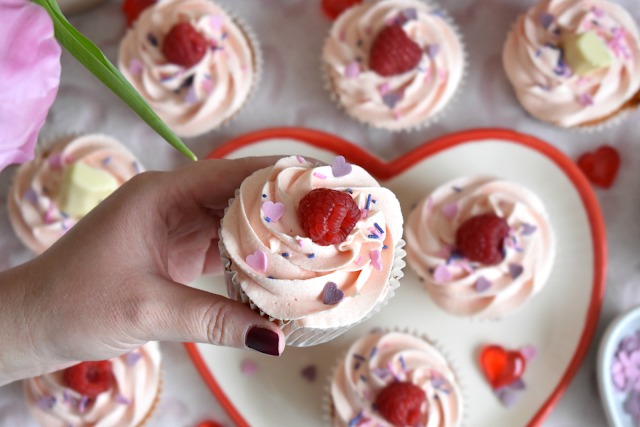 Will you be baking any treats for Valentines Day beaut's? I'd love to know what your thinking of doing! Degustabox Review + £5 off Discount Code! Benefit Makeup I've Been Putting To The Test!